How to play banjo chords! Are you searching for beginner’s Banjo-App? 120 Banjo chords are the right one! With this App, you can soon be your popular Banjo Music player! More than 120 Banjo chords will help you learn to play your favorite music on a Banjo or compose your own Banjo Music with the help of this app! 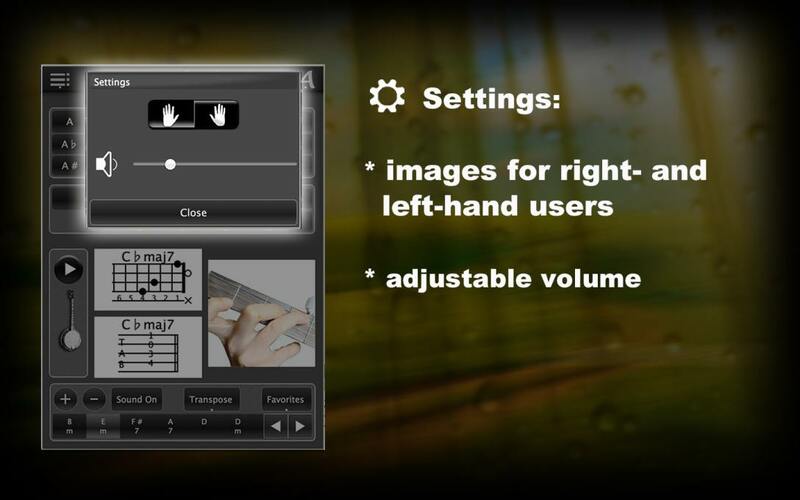 Now select a chord you want to try, and it appears on the screen as a Banjo Music, tabs and as color images with finger positions on a banjo fingerboard. Listen to this chord! 120 Banjo chords also offer you the opportunity to save, delete, create and reload have your chord progressions for your favorite songs. 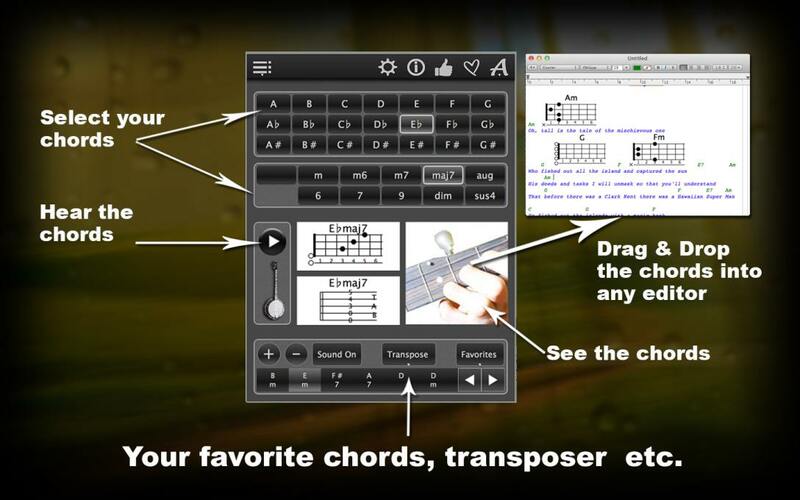 You can drag and drop this chord sequences with the help of drag and drop in your documents. You can change the order of the chords in your chord sequences each time, and whole chord progressions transpose to your singing voice. The free version of this app you can WATCH here. We explained to you exactly how to play chords on your banjo fingerboard and how the various options on the app can support your Banjo Music. Test for Video Banjo chords learning is easy! This app will help you decide the correct chords for your Banjo Music. If you are right-handed, click on the right hand, and on the left, if left-handed. You can also adjust the volume. Directly select a chord, the tone, and the chord type, immediately can you see how this chord in the chord diagrams and tablature looks like. You will likewise see how to place your fingers, in order to play the chord. Now listen to this chord! 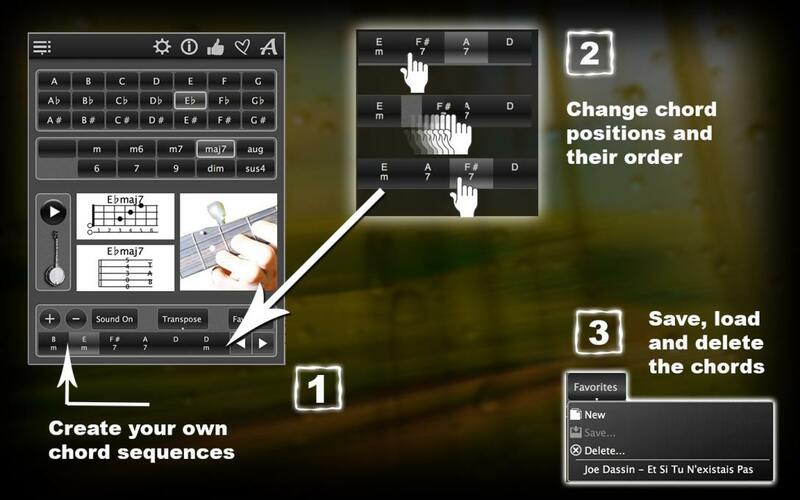 And create chord progressions by selecting a chord, and clicking on the plus sign. Then Select your next chord. Again, click the plus sign. Do so until you have your desired chord sequence. 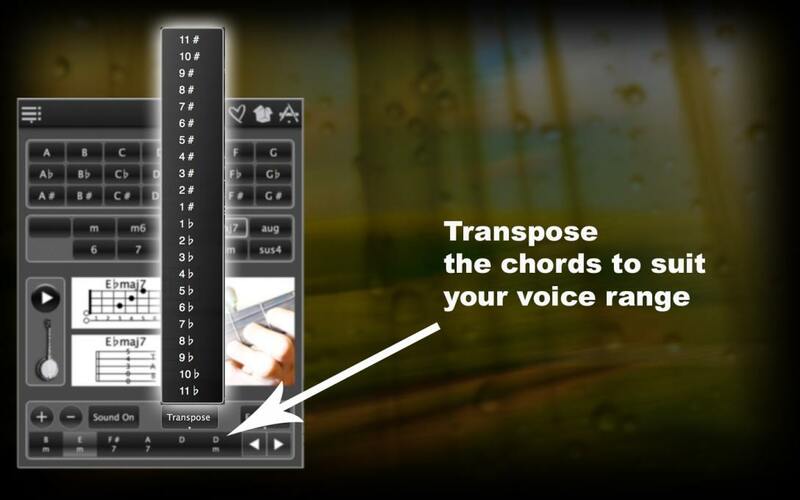 You can interchange the order of the change chords, here’s how you can also transpose this chord sequence; You can save this chord sequence by Clicking on Favorites, then save, enter a file name and is answered! Now go over to see if your chord sequence has been saved. I have used your 120 Banjo Chords app, but wanted to ask you to consider adding the ability to change the banjo to plectrum tuning. Is that something you could do? I have purchased your app and find it very helpful. Is there a way that it will show me the same chords further up the neck? Hi, been using your app and find it quite good except that the tab finger box sometimes calls for using the 5th and 6th finger for some chords. Is this a common thing for banjo players to have? I may have to go back to accordion. 6th finger? In the app photos the player uses only 4 fingers.